...what's the deal with that Domino Sugar refinery that's clearly been abandoned? The NYT gives us a tour of the insides and tells us what's to become of this place. 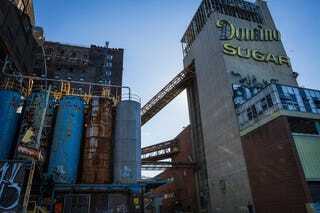 Sugar is everywhere around the long-shuttered plant — in hardened brown clumps that are perched on the beams and wispy stalactites that drape the machinery, in a shiny film that blackens the walls and a syrupy residue that slickens the floors. Anyway, give the article a read and be sure to check out the slideshow of pictures!